At our Access to HE Forum held at Middlesbrough College STEM Centre on 31st March 2017, awards were presented to five students who completed their Diplomas last summer. Their providers have highlighted their achievements as being outstanding for a number of reasons and so we wanted to take the opportunity to recognise their remarkable accomplishments by inviting them along to collect their award. 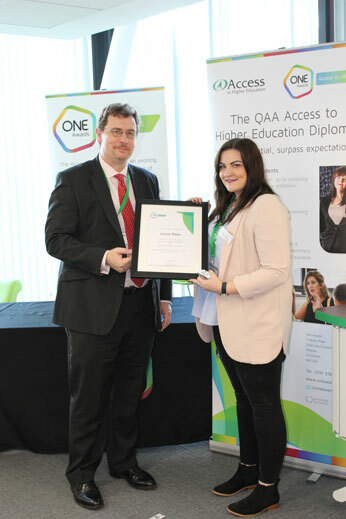 The Awards were presented by Steve Tipping, Access Manager at the Quality Assurance Agency for Higher Education (QAA) the regulator for the Access to HE Diploma. Laura came to us having already studied law AS Level. She had previously worked at McDonalds and call centres, travelled extensively through Australia on her own for a year and was clearly determined to move herself onto a career in science, initially intending to go into crime scene work. 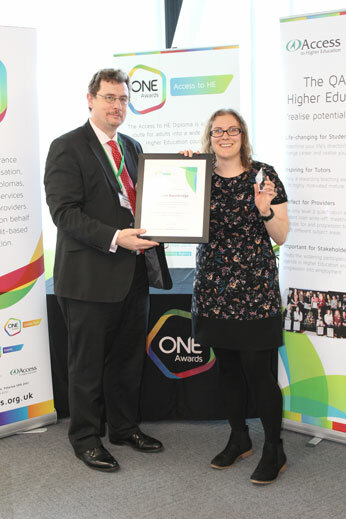 Last year Middlesbrough College was one of two Access providers in the region to gain approval to pilot the Registered Science Technician Scheme (RSciTech), operated by the Science Council and the Gatsby Foundation, to encourage Access students into careers in science. This provided the perfect opportunity for Laura who signed up for the scheme. As one of our most hard working and committed students Laura was selected to complete her Access Scientific Project, a key component of achieving RSciTech status, with Centre for Process Innovation (CPI). This placement inspired her to switch her university course to chemistry. At the end of the Access course Laura underwent a rigorous external assessment with the Royal Society of Chemistry and was awarded RSciTech Status as well as her Access to HE Diploma. She was the only student to achieve it in her year. Laura is continuing her success at Teesside University studying Chemical Engineering. Chris joined the access course with the ambition to progress into Mental Health Nursing at University. He started the course with low confidence in his abilities but a fabulous personality from day one. He soon became an extremely popular and supportive member of the group, joining the College team as a member of the student union and also the class representative for his Access class. He was also a source of inspiration for other students as he managed to start a brand new job role in the health field alongside his studies, attending all lessons and maintaining a cheery and positive attitude. Chris created a campaign as part of his course in which he created his own project ‘Take Time to Talk Gateshead’. This idea was borne out of the idea of discussing mental health rather than treating this as a taboo subject. Chris went above and beyond, creating a seamless and extremely encouraging project. Many of his peers observed this which supported an open dialogue about mental health within classrooms and inspired many others to complete additional research into this topic. At the end of his course Chris was successful in achieving a place at Northumbria University to study Mental Health Nursing. We are incredibly proud of him and know he has a bright future ahead. Richard joined the Access programme in September 2015, making a life changing decision to pursue a university course in History. In order to facilitate this he had to make some difficult and challenging decisions with respect to his private and working life, changing his work to accommodate the demands of the Access course and the long journey from Alston to Newcastle. He demonstrated an exemplary approach to his studies, with a 100% attendance record and an impressive level of commitment to all his courses. He was diligent and conscientious and always willing to try new strategies and approaches to improve. He listened well to feedback, applying it immediately in his work, research and class contributions. 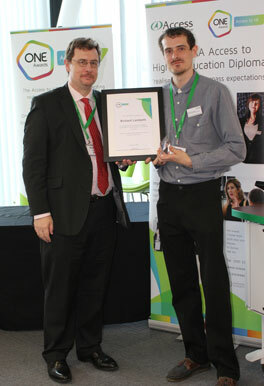 Richard consistently submitted outstanding work, receiving distinction grades overall in every assignment he submitted. Richard’s innovative and reflective approach to his studies was reflected in his oral and written work. The development of his higher-order, critical thinking skills was evident consistently in all subject areas. His skills of critical evaluation were exceptional and developed throughout the course. His independence, application to his studies and very high level of work led to exceptional progress. Glenn (pictured left) joined the Access to HE course in order to further his professional development as a foster carer. Glenn’s commitment and academic ability was apparent from the start; his eagerness to learn and desire to build upon his own capabilities was infectious, inspiring everyone around him. As a tutor, I’ve never had to work so hard to come up with new and inventive ways ‘to improve’ because the standard and quality of work submitted was consistently excellent. 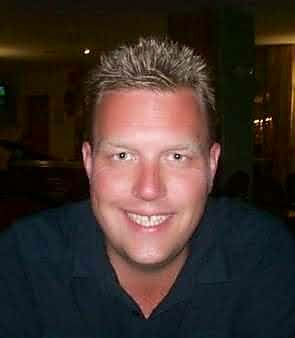 Glenn was enthusiastic and fully engaged with the Access course for its entirety, and despite deciding towards the end of the course not to pursue his university offer to study Social Work in order to prioritise his ever growing foster family; he never let his own high standards slip. There were points during the year for Glenn within his personal life which would have challenged any Access student (going through the intense processes of adoption for example), yet he never once allowed this to affect his enthusiasm and optimism for his studies. It was an absolute pleasure teaching Glenn, so much so that I have asked him to return to guest lecture on future Access courses, especially in relation to accessing academic texts, reading and writing critically and referencing accordingly. He is one of the most capable students I have ever worked with, and I hope that in the future he will go on to pursue university study. Glenn was unable to attend the event, so his award was presented to his tutor Vicky Meaby from Darlington Borough Council on his behalf. Paula started on the Access programme as a part-time learner. She had made the difficult decision to return to education despite resistance from family members. On starting the course, she had to juggle a number of challenging personal and home circumstances to be able to attend on a regular basis. Initially, she was very under-confident and lacked self-belief, finding it very difficult to complete the tasks and assignments. Despite her lack of confidence she attended every lesson and began to apply herself with an impressive level of motivation. She visited a library and borrowed books for the first time in her life and began completing a wide range of background reading to develop a depth of understanding of her Diploma subjects. Her class work reflected this depth of reading and she would make insightful contributions to class discussions, bringing in relevant additional reading and research material to share with the group. 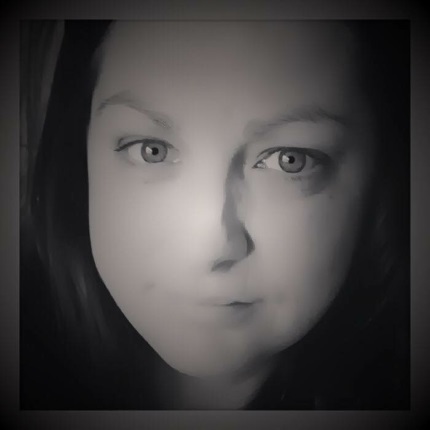 Paula developed in confidence throughout the course and, despite her significant lack of self-belief; she finally overcame her fears to deliver excellent presentations in various subjects. Additionally Paula recognised that she could improve her IT skills and has taken the ECDL qualification successfully alongside her Diploma. In her 2nd year on the course Paula was diagnosed with a serious illness but, despite this, she continued to work hard and achieved distinctions in all her subjects. Paula has also shown her increased confidence in her interaction with other learners, where she was happy to discuss what they are learning and to share her knowledge. As an Access team we were very impressed with how she grew in confidence and developed strategies to improve her study skills to such an extent that she gained a place to study Psychology and Criminology at Northumbria University; her 1st choice. This is particularly commendable given her personal circumstances. 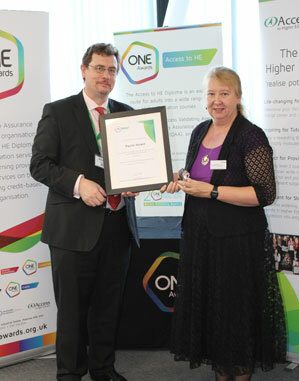 Paula was unable to attend the event, so his award was presented to Maria Hawthorne from Newcastle City Learning on her behalf.